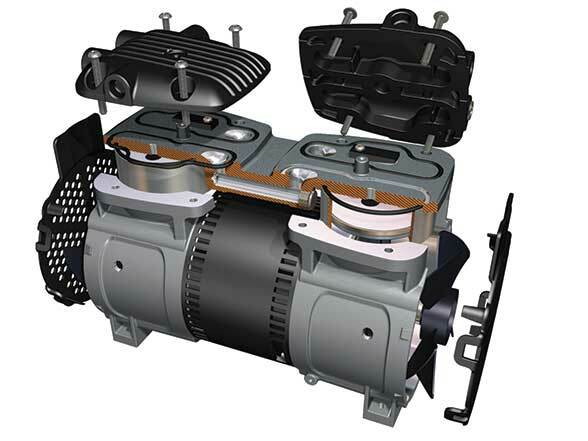 While other manufacturers have been busy selling rocking piston compressors that produce a lot of noise and less-than-ideal pressure, Gast has been quietly setting the new standard by re-engineering our oil-less rocking piston from the ground up. The result is a unit that delivers quieter performance, higher pressure, a longer life and greater application flexibility. The sleek, new 86/87R Series is not just another pretty product. It’s beauty runs deep as it performs in ways not yet seen in the industry. The patented crossover chamber design regulates and controls airflow to dampen sound and optimize performance, while delivering a wide range of pressure level options. Because the 86/87R Series can easily retrofit into an existing footprint, it’s also a smart, flexible solution for a wide range of markets and applications, viz. Environmental, General industrial, medical, printing & packaging, food & beverage, transportation, laboratory, and material handling. “When we set out to re-engineer our rocking piston compressor, we aimed to do more than just increase pressure. We set out to dramatically reduce sound, enhance flow, create a standard footprint for easy retrofit anywhere in the world and improve the compressor’s aesthetics,” says Gast. The inherent design of rocking piston technology makes it the optimal choice for applications requiring high pressure or vacuum and air flow in a small package. The flexible cup is made with superior materials and mounted on top of the connecting rod, creating vacuum or pressure while maintaining a tight seal against the cylinder walls in a rocking motion. The forgiving design has fewer components, causes less friction and has a low exhaust temperature, for greater reliability and durability for the life of the product. Despite it’s small size, the versatility of 86/87R means this is the right product to deliver quality air solutions. Tags: 86/87r seriesrocking pistonShavo Technologies Pvt. Ltd.